What Is the Aging and Cellar Time for Old Foghorn Barleywine? Bob Brewer answers your questions about beer and brewing. Carl Burger (via Facebook): I’d like to know more about Old Foghorn. Specifically it’s cellar time, and bottle aging prior to release. Cheers. Bob: This is an interesting question, Carl, and the answer involves a bit of Anchor history. Years ago, way back in the mists of antiquity as far as craft brewing is concerned – like the ’70s and into the ’80s, we used to brew Old Foghorn Barleywine once or twice a year. Back then no one really had a clear idea of just what a barleywine was, much less was inspired to pay a hefty premium for it. Our sales were slow and sporadic to say the least. 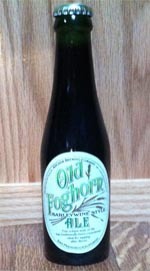 We were bottling Old Foghorn in a seven-ounce “nip” bottle that required a complicated changeover of our packaging equipment from a twelve-ounce system. Due to other production needs, this changeover procedure was sometimes scheduled and re-scheduled several times, resulting in some unusually long cellaring times. This, and that the fact that sales were really slow, made for an inexact aging timetable that sometimes extended into several months and beyond. Fortunately, Barleywine holds up to lengthy cellaring and we used to talk about it with pride as if it were somehow a deliberate thing that made us special. Not that there’s anything wrong with letting it sit in the tank for a while until we got around to it, but there was little, if any, improvement beyond the three-week window. Besides, we knew that the slow sales would likely result in lengthy bottle-aging, which is traditional in British ales of a similar style – a fact that would hopefully satisfy the one or two purists in existence back then. In the late 1980s we upgraded our labeling machinery to modern standards, in part to apply a back label that contained the newly requisite health warnings, UPC codes, state-mandated deposit information, etc. We lost the ability to adjust for a smaller bottle, and since Foghorn sales were tiny and a twelve ounce bottle would have necessitated an expensive label and packaging redesign, a decision was made to abandon the product. I personally argued against this because I believed that I could successfully sell Old Foghorn as a draught-only product. We had plenty of new kegs and there would be no extra expense in packaging. This argument was met with skepticism, given the low level of bottle sales and the two cellar tanks full of Old Foghorn that were slated to be dumped. In the end we dumped one tank and I got the other one in kegs. The keg idea worked well enough to keep Old Foghorn alive for the next seven years until we began to bottle it again. I believe this fact contributed to the survival of the style in craft brewing since we were the only brewery in America making a Barleywine at that time and it was years before anyone else made one. Eventually we acquired a secondary bottling line and, in time, moved up to a twelve-ounce package for Old Foghorn. How did all this affect cellar times? Well, a keg is just a small tank, really. Kegged beer that is properly handled and pasteurized, as all Anchor products are, will hold up for well over a year. We would then cellar Old Foghorn for three or maybe four weeks, and then package it to free up the tank. When we started to bottle it again, we kept to the same schedule because we run both packages from the same tank on the same day. Fortunately for us, craft beer consumers are now well aware of the style and many other craft breweries produce a Barleywine. Although industry-wide sales of the style are still relatively low, it’s enough to keep the barleywine tradition alive, and we still produce Old Foghorn in draft and bottles.